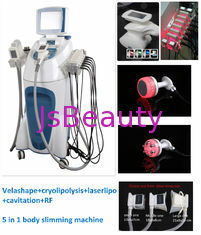 JS-5S has combined with the RF, vacuum, outer automatic roller, infrared light, green light and blue light, cavitation, , lipo laser. It is the new updates of V9 velashape technology. It also combines with RF and 3 photons (red, green, blue) to generate heat. It can penetrate the skin to a depth of 15mm by mechanical movement, which is far more than the depth of the other devices currently on the market. While the heat is conducted, the mechanical movement is carried out simultaneously and so is the fat. In this way, it makes the skin more flexible. It can improve the figure and the skin surface. Although the weight of the patient does not reduce, the patient will look much slimmer because the whole fat area has been re-assigned. We have selected 20 women of different ages and skin types for a test. Against their main fat parts – thighs and buttocks, we conduct 3-6 treatment times and each person’s body curve has improved to a great extent. Meanwhile, the fat around the thigh has obviously reduced. The side effect of JS-5S treatment is minimal. The skin surface of each treatment receiver will only appear flushed from some minutes to an hour or appear slightly edema, but a few hours later, the appearances of the fat accumulation parts will be greatly improved. For the past few years, we have been using the method of deep fat massage, which is very time-consuming. Also, the treatment receiver will feel uncomfortable for long duration of treatment. However, the time for JS-5S treatment has greatly shortened. It only takes 30 minutes to do thigh and buttock treatment so the treatment receivers will feel more comfortable compared with the deep fat massage. According to their description of the treatment process, most people are very comfortable and even sleepy when the massage is up and down the thigh. 5.It increases the skin tissue elasticity and makes the skin more smooth and delicate. 6.Laser for fat reduction, use the 650nm soft laser to destroy the deep fat cells, broke the cell membrane, change the fat to triglyceride, then leave out the body thanks to metabolism. 6.Vacuum+/- massage mechanisms enable precise targeting of energy to the tissue. 9. 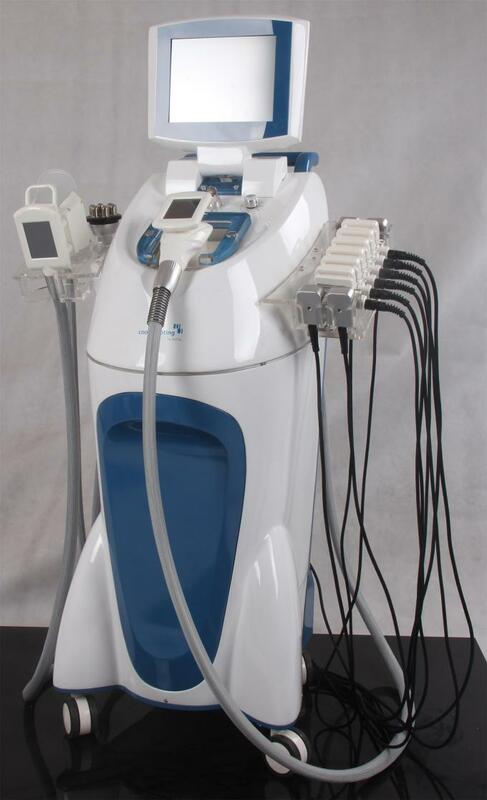 This machine can treat for whole body: arms, thighs, buttocks, neck,face,eyes,etc. 11. 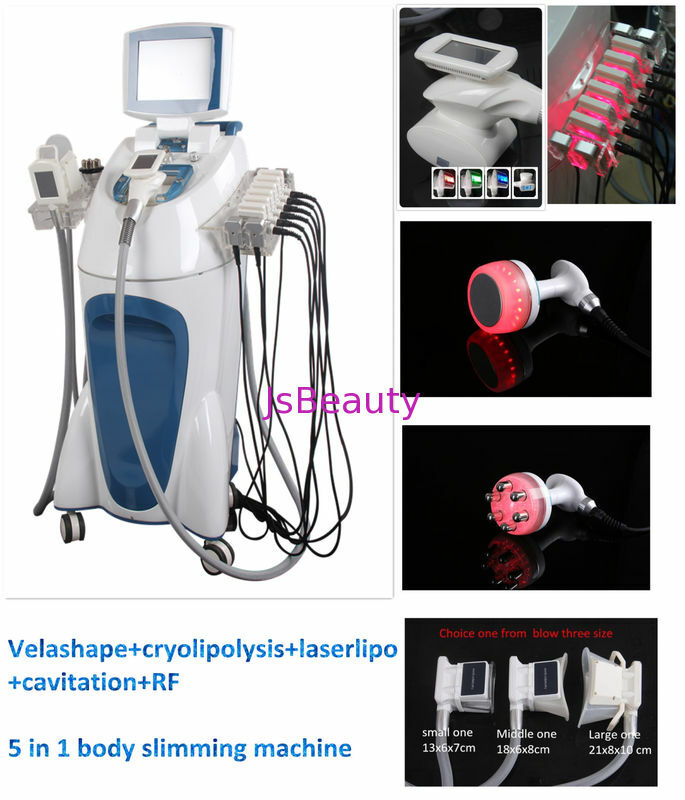 Combined with the velashape velasmooth, lipo laser slimming, RF ultrasonic cavitation and BIO for body contouring, shaping, fat and cellulite reduction, etc. 12. Anti-aging, wrinkle removal, skin lifting&tightening, etc. B. Effective for weight loss, fat reduction, cellulite reduction, skin tightening & lifting, etc. E. It is a non-invasive treatment with a comfortable process. F. RF: 5MHZ RF penetrates the skin depth with 5-15mm. It focuses on heating the fat cells and treats cellulite intensively. G. Vacuum: The vacuum can increase blood circulation and promote cell metabolism. rolls of fat so that the cooling effect can reach the fat cells directly.